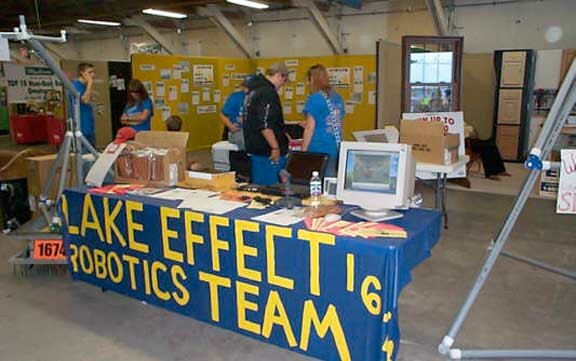 ROBOTICS UPDATE JANUARY 3, 2006: The Robotics Team still has no large sponsors for this year. The team has two mentors, unfortunately this is not enough to mentor the team for 2006. The team members were supposed to go out to local businesses over break but no one did. The Lion Club donated $200 dollars to the robotics team this year. I really appreciate them doing this, and would like to thank them a lot. The team is selling pretzels for one dollar a bag to help raise money for the 2006 season. Cases go for 18 dollars. If you are interested, please call 231 794-9548 or 231 794-9589. The Onekama Robotics Team needs sponsorship to continue the program. This program helps students to develop the use of science and technology outside of the classroom. LOGO LEAGUE UPDATE JANUARY 3, 2006: The Lego League did extraordinarily well at the competition, only falling a few points short of making the top eight. 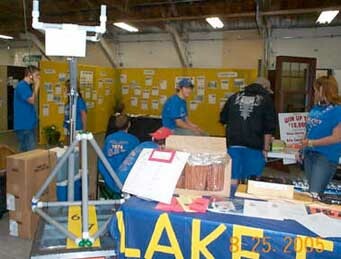 Logan Gutowski, Bernard Pesko, and Chris Pesko are mentors of the Onekama Lego League. These three mentors and the team attended the competition in Zeeland, Michigan on December 3rd. 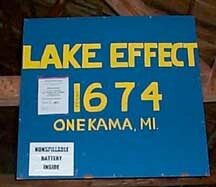 The Onekama team did remarkably well on the playing field. The team almost made it to the top eight finalists. The team fell fourteen points short. Ryan Pienta and Thomas Koon were the top programmers of the Mindstorm Robot. These two individuals and Bernard Pesko put in a lot of hard work after school hours. This is a very expensive endeavor these young engineers and scientists have undertaken and community sponsorship is gladly welcomed. They offered things like pretzels and candy among a few things for sale as a fund raiser , as well as had a very informative exhibit which included a computer presentation. The tall item to the left of the photo is their robot.